With her signature comic-strip style, Marcia WIlliams takes us behind the scenes at some of ancient Rome's most famous moments. Meet Dormeo: gladiator, dormouse, berry-nibbler, and guide to ancient Rome. He'll take you on a tour of Rome's most famous moments and most colourful characters - from the temperamental gods and goddesses of Mount Olympus to the wolf-raised Romulus and Remus, from the birth of the Roman Republic to the death of Julius Caesar. On the way are fascinating glimpses of life as a Roman citizen, from families to festivals, gladiators to guards, as well as a look at some of Rome's best-known emperors (good and not so good). 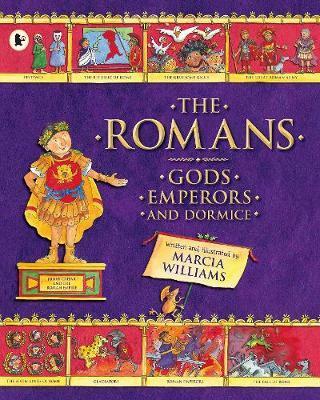 Vibrant, engaging, and packed with Marcia Williams's trademark warmth and humour, this graphic storybook is a young reader's ideal introduction to the rise and fall of the Roman Empire. With her signature comic-strip style, Marcia WIlliams takes us behind the scenes at some of ancient Rome's most famous moments.